Jordan Shipley (former UT and NFL wide receiver and co-host of The Bucks of Tecomate TV show): "I actually spent a lot of Thanksgiving Days playing football over the last 12 years," said Shipley. "My best Thanksgiving hunting memory would have to be bringing in a wild turkey for my Mimi to cook alongside the traditional (store bought bird). We cut it up into strips and then fried it and served it with gravy! (It was incredibly good!)." Don Kisky (co-host of Whitetail Freaks TV show): "Back in the early 90s, my wife, Kandi, and son, Kaleb, and I were heading to Missouri for Thanksgiving dinner at her grandma Richardson's house. They were calling for a snow storm and the roads were slick. But I was trying to use it as an excuse to get back into the woods." While Kisky loves the Thanksgiving Day holiday as much as anyone, he is after all the co-host of a top-rated white-tailed deer hunting TV show. "Thanksgiving time has always been an excellent time to get back into the woods because the bucks are breaking (away) from their does," he said. "So we headed back to Iowa and I (quickly) bailed into a tree and did a hard rattling sequence. Through the trees, I saw deer legs (moving). I then threw one small grunt (out) and in walked a giant, right on in all the way to the base of my tree. I shot him at three steps and the buck scored 181 inches." Kisky then added: "Kandi and I are most thankful that we get to do what we do for a living and get to spend time in the woods. And we're obviously thankful for our family, friends and health." David Holder (co-host of Raised Hunting): "My best Thanksgiving holiday hunting memory? That was being a kid and going (hunting) with my dad, my brother and all of my uncles to deer camp in the Appalachian mountains of Virginia," said Holder. "We shot a few deer with our guns during that opening week every year, but what I remember most was feeling like a part of the guys and being there with my family. It breaks my heart to realize that most of them, people that I loved so much, have passed on now. This is where a young boy became a young man." Holder also added: "Now, I'm most thankful that I have my own family to share that time outdoors with – I am truly a blessed man." Nicole Reeve (co-host of Driven with Pat & Nicole): "Our best Thanksgiving memory? That was when our daughter, Olivia, shot a buck on Thanksgiving evening a few years ago. 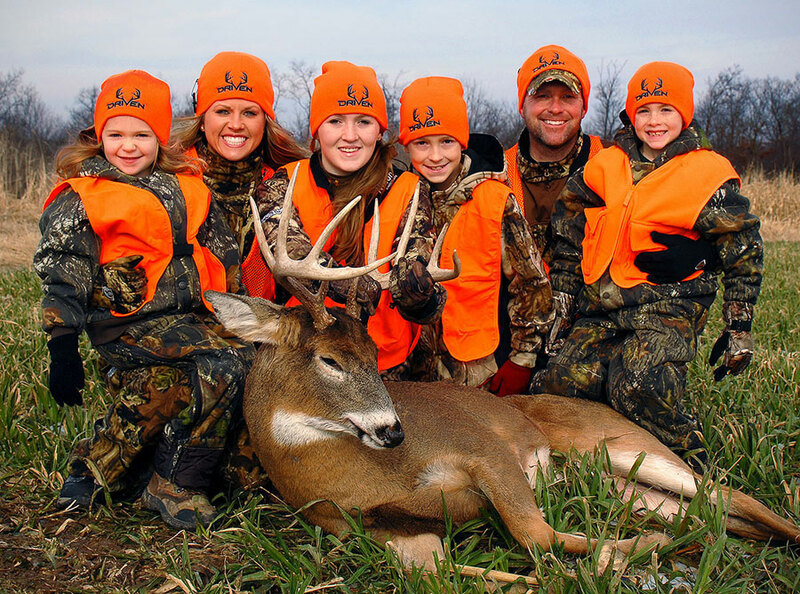 The entire family went out and blood trailed the buck and we enjoyed the evening together in the outdoors!" She also added: "This year, we are most thankful for our new little bundle of joy! That's Cash, our newest addition to the Driven family. He has added so much joy and love to our family. Baby Cash is such a blessing!" Tiffany Lakosky (co-host of Crush with Lee & Tiffany): "What we are most thankful for this year is an easy one, and of course, it's the birth of our son, Cameron, who will be 8 months old (soon) and celebrating his first Thanksgiving with us." "As far as our best Thanksgiving hunting memory, that was years ago in Kansas where I was filming Lee. We almost didn't go out as we were so exhausted (from recent hunting trips and filming). But we went out at the last minute and Lee rattled in one of his biggest bucks to date and he smoked him while I was running the camera!" Leading to another Big Buck Down! holiday memory in Crushville. Not to mention a supply of fresh venison backstraps, a worthy substitution for any Thanksgiving Day roast turkey. No matter where a person happens to find themselves spending the annual November holiday.